At Lynnwood, WA Reaction Physical Therapy, your Physical Therapist will create an individual therapy program that is specifically developed for you based on a complete evaluation of your condition. Our rehabilitation philosophy is to promote healing through a combination of exercise and manual therapy, as well as to educate our patients in injury prevention, body mechanics and self-help techniques. We aim to provide you with the best physical therapy experience in Lynnwood. Same Day Appointments Available. Call to schedule today (425) 967-3970. Lynnwood (Reaction Physical Therapy) provides expert care for a wide range of conditions, click the links below to learn more or call to schedule with a Physical Therapist. 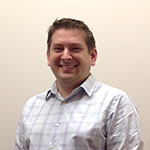 Physical Therapist, Clinic Director Evan is a Pacific Northwest native originally from Snohomish. He completed an undergraduate degree in exercise and sports science from Western Washington University in 2006. From there, he completed his Doctor of Physical Therapy degree from Regis University in 2009. He believes that there is no "one size fits all" approach to therapy and works in close collaboration with patients and their physicians to develop an individualized treatment plan to not only help with the current problem, but to reduce future occurrences. His treatment approach is rooted in manual therapy combined with corrective exercise. He enjoys seeing a varied outpatient caseload including spinal pain, extremity dysfunction, treatment of the injured worker and overuse injury. Bachelor of Science in Exercise and Sports Science, Western Washington University 2006. Physical Therapist Lindsey has been a physical therapist for over 18 years now. She especially enjoys working with orthopedic, pelvic floor and pregnant clients. Her patients appreciate her listening skills as well as her ability to teach them about their bodies so that they feel empowered to help themselves during and after the rehabilitation process. Physical Therapist Assistant Lindsey was originally from California, but has lived in the Seattle area since 2008. She graduated in 2010 from PIMA Medical School with a degree in Occupational Science. Lindsey always wanted to be in the healthcare field and once she was introduced to Physical Therapy, she was hooked. Lindsey enjoys the ability to work with a variety of patients with different diagnoses and backgrounds. She believes that providing the best care involves not only skilled techniques and educating patients, but also putting a smile on their faces. In her spare time she enjoys exploring the great PNW with her partner and dog. She also enjoys cooking, finding new restaurants and watching movies.